In the world of cinema, filmmakers never know when great inspiration is going to hit. 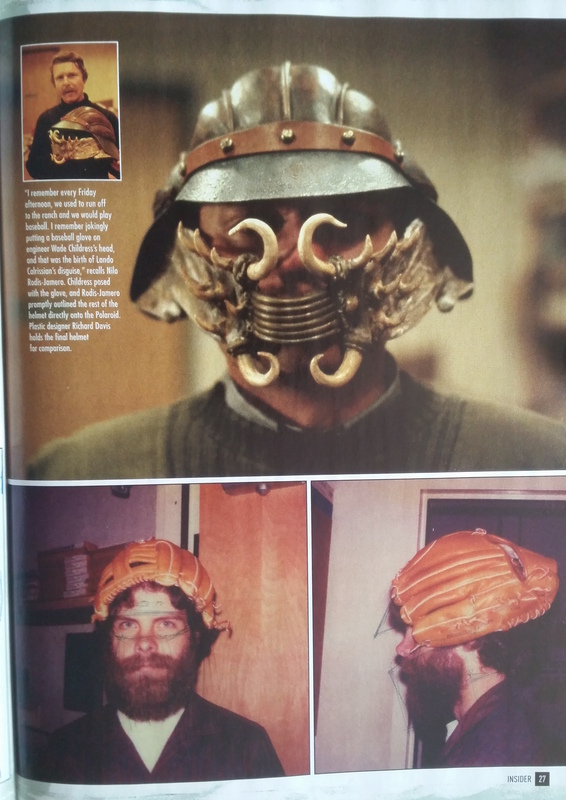 Take, for example, the process that went into creating Lando Calrissian's bounty hunter helmet for Star Wars: Return of the Jedi. As it turns out, the design of the garment simply came from a moment when the film's costume designer jokingly put a baseball glove on top of the head of one of his co-workers. I remember every Friday afternoon, we used to run off to the ranch and we would play baseball. I remember jokingly putting a baseball glove on engineer Wade Childress's head, and that was the birth of Lando Calrissian's disguise. After that moment of inspiration, Rodis-Jamero had Childress pose for him with the baseball glove on his head. From there, the costume designer photographed him with a Polaroid camera and then outlined the rest of the helmet on the image. (which you can see here). And that's how Lando Calrissian's helmet came into existence! Looking at Lando's helmet, it's pretty clear where the baseball glove element is featured in the design. After all, the lines across the top of the helmet are very similar to the the spaces between each "finger compartment." 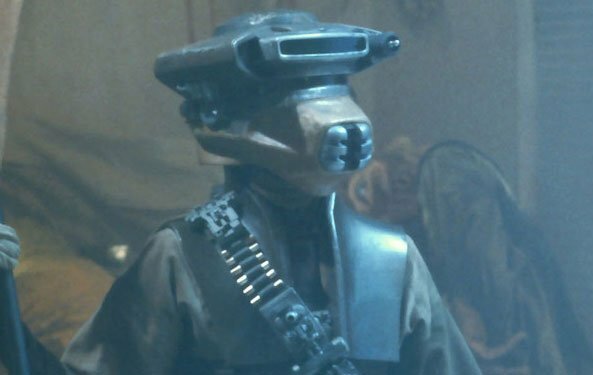 Cool as this is, though, we are still left wondering exactly what inspired him to create the odd piece that comes around the front of Lando's face. It honestly looks like the jaw skin and teeth of some kind of horrific monstrous alien creature that was sliced off and then used as a mask. It's pretty horrific, but I guess I get it, considering Lando's primary goal was not to draw attention to himself. I don't know about you, but if I saw a guy wearing mouth skin on his helmet, I would not make direct eye contact. While we're on the subject, can we get an explanation for Princess Leia's disguise as well? Hollywood history is filled with random stories like this, but what really makes them interesting is that they show the truly amazing creativity possessed by those who make our favorite movies. Most people would see a guy with a baseball glove on his head and either a) laugh or b) think nothing of it. Nilo Rodis-Jamero saw it and came up with the idea for a badass helmet worn by a wonderful character.